Asking missionaries open-ended questions, instead of making the wrong assumptions, is one way to welcome missionaries back to the U.S. Since arriving in the U.S. for home assignment, we’ve encountered some misconceptions about our life and ministry in Europe, missionaries in general, and Austria (the country where we serve) in particular. I do not fault people at all for having these misconceptions. It is, of course, no one’s fault if they have not had the opportunity to travel to Europe or have not been exposed to some of the realities of missions. In an effort to educate and raise awareness about our life as missionaries in Europe, I thought it might be helpful, in light of these misconceptions, to try and address some of these questions. 1) Many European cultures are basically the same, especially if they speak the same language. The irony is that Austria and Germany are two very different countries and cultures. Lumping them together would be like someone saying that Canada and the U.S., or even the U.S. and England, are basically the same country, because they speak the same language (although in Austria, we speak a different dialect of German). Because countries in Europe are small compared to the U.S. and many are equivalent in size to an American state, the temptation exists to lump many European countries together and assume similarity. However, each European country is unique in culture, traditions, language, and values. I think much of Europe is beautiful, and we certainly live in a beautiful country and city. However, our everyday life probably looks like yours in many respects. We don’t spend much time “playing tourist.” We have to work, run errands, buy groceries, do laundry, handle our medical needs and banking, and all of the other mundane things of life. Oftentimes, these tasks take more time for us living overseas than they do for someone in their home culture. In our free time, we often get together with friends for a meal or time together. Even though we live in a beautiful place, we still lead a normal life, and nothing about it is glamorous. 3) Taking a vacation to another European country must be expensive and lavish. Getting away from home as a family is something we value. However, like most people, we live on a budget. When we plan family trips and vacations, we try to be careful about how we spend our money so that we can be wise stewards, while still having enough time away to rest. Living in Europe, this often means driving to a neighboring country or taking the train somewhere. A trip to Prague, Italy or Croatia might sound lavish and expensive to an American, but if done right, these trips are the cheapest options available to us (especially thanks to AirBnB). 4) Language fluency is clear and measurable. You’re either fluent, or you’re not. Once you live overseas, the meaning of the word “home” changes, and sometimes this word can carry quite a bit of emotional weight. Many people greet us in the U.S. by saying “Welcome home!” While this is said with good intentions, it usually makes us squirm a little bit. Being in the U.S. no longer feels like our home, and hearing the phrase brings up all sorts of complicated emotions. Our home now is where our life is in Europe, where we live, where our dog lives, and where our friends and church are. 6) Our home assignment time in the U.S. is a restful break. This is a complicated one. Part of the reason WorldVenture asks us to come back to the U.S. is to take some time to rest and be back in American culture. We understand their reasons for this. The time here has been incredibly valuable. However, resting here has been a struggle for us. Traveling around, being away from home, lacking regularity and routine, and staying in more than 20 places over the course of seven months: this temporary lifestyle is not very restful. It definitely has come with many blessings, but we don’t ever feel fully at rest being away from home. 7) We are teaching our toddler the national language, and she’s already growing up bilingual. Many people are surprised when we tell them that Ellie only speaks English. However, our decision not to speak German, the national language, with her has been very intentional. First, we want English to be our primary language at home so that we, as parents, can be most comfortable in our home environment speaking our native language. Second, our German is not perfect and never will be, so Ellie shouldn’t be learning German from us. She should learn it from native speakers. Third, there is no doubt Ellie will become a fluent German speaker as she goes through the Austrian school system. We want to make sure she gets enough English in her life that she is truly bilingual and doesn’t ever lose the English. Therefore, we are focusing on that first. She will start preschool this fall and be fully immersed in the national language for the first time. Being a toddler, she will pick it up very quickly! 8) It’s easy to describe a foreign culture to someone who’s never been there. We get a lot of general questions about our home country. “How are Austrians different than Americans?” “What is it like there?” or “Can you describe the culture?” These questions are so hard to answer, especially the longer we live there. Cultural differences are very complex and the longer I live in Europe and get to know more nationals personally, the more I experience all of the different personalities that exist there, just like in every other culture. In every country, there is variance among people and for every “cultural norm,” there are plenty of people who defy it. It gets harder and harder for me to fit our home country and its people into a neat little box or tidy descriptions. 9) We live in the snow-capped Alps. If you’ve never traveled to a particular country, it is easy to assume that it looks like it does in the movies. For example, when many Americans picture France, they might envision strolls along the Seine River and views of the Eiffel Tower. When envisioning Austria, they may picture snowy mountains or scenes from “The Sound of Music,” where “the hills are alive.” Yes, these places exist in France and Austria, but both countries offer diverse landscapes and places to live. 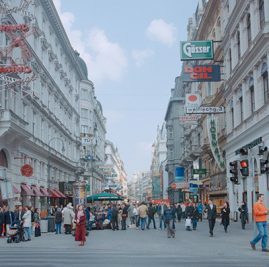 In Austria, we live in the middle of an urban area in a city of 2 million people. We do not ski, and we do not hike through the mountains regularly, nor do we spin in green fields like Julie Andrews. We only see the mountains a couple of times a year. A missionary in Paris probably does not walk past the Eiffel tower every day holding a baguette and munching on Brie. The best approach when asking overseas workers about their lives is to pose open-ended questions and try not to make assumptions. As missionaries in Europe, we truly appreciate every question someone asks us about our life there, no matter how difficult they can be to answer. This blog was adapted from Bethany Johnson’s original post here. Bethany and her husband Nate serve as church planters in Vienna, Austria. Read more about their ministry on their blog, or check out their WorldVenture page.